6. Compatible for most bike bicycle handlebar. also support holding on the handlebars of motorcycle, electromobile and scooter, etc. 【ALUMINUM ALLOY MATERIAL】- Made of aerospace grade aluminum, strong and durable. 【MULTI-ANGLE INSTALLATION】- Multi-angle installation, humanized design, suitable for different habits of cyclists. Cilp hole with 2 holes, free angle installation. 【UNIVERSAL COMPATIBILITY】- Suitable for 4-6.5 inch phones, including iPhone X 8 8 Plus 7 7 Plus 6s 6s Plus 6 6 Plus 5s 5c 5 SE, iPod Touch, Samsung Galaxy S9 S8 S8 Plus S7 S7 Edge S6, Galaxy Note Series, Google Pixel, HTC, LG, Other Smartphone. 【SECURITY UPGRADE】- The phone clip slot and handlebar clip slot are padded with silicone keep your phone securely in place, preventing it from falling, slipping and scratching during cycling and motorcycling. 【WIDE APPLICATION】- Compatible for most bike bicycle handlebar. also support holding on the handlebars of motorcycle, electromobile and scooter, etc. This bike mount frees your hands from the phone and GPS / Navigation. If you have any questions about this product by Leagway, contact us by completing and submitting the form below. If you are looking for a specif part number, please include it with your message. 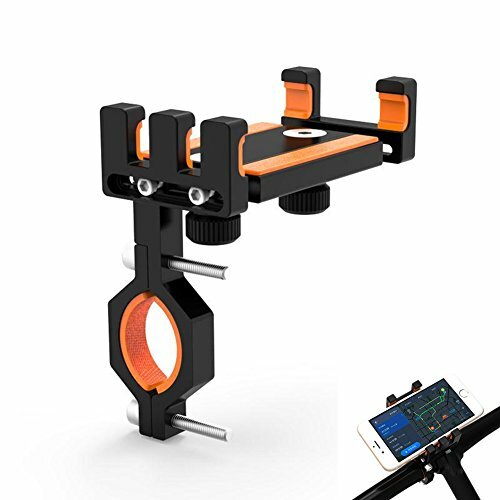 Clamptastick !- Universal Cell Phone holder for mounting on rearview mirror compatible with Mobile iOS devices, Android Smartphone GPS and More.